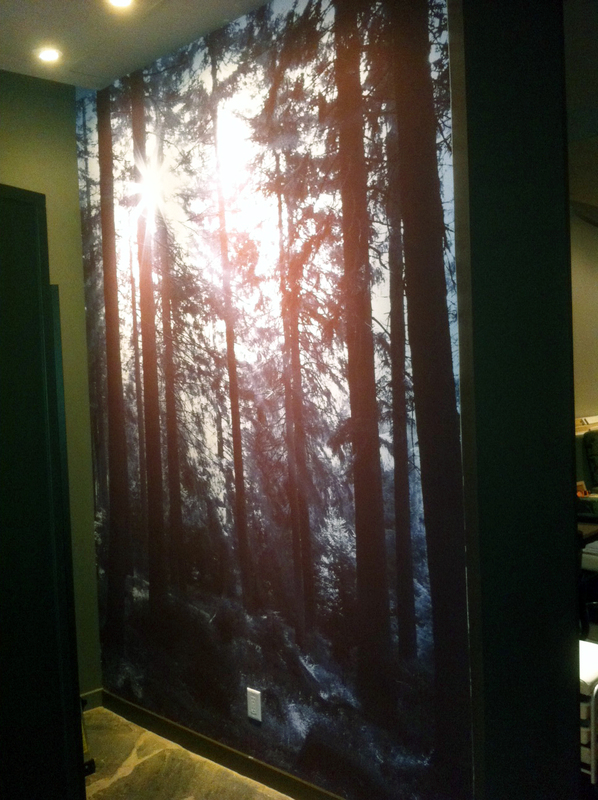 Our wallpaper prints, and custom murals installations are 2nd to none. Vinyl installation is considered to be an art form here at Blast Media, and we take it seriously! We like to ensure all the edges, and seams are tucked away perfectly. Nothing looks worse then a print with bubbles or wrinkles in it. Our pricing is always untouchable – but it really excels on projects of 400sq ft. or larger. That’s because our costs are drastically reduced with bulk production, and we always pass the savings onto you. Our wall mural vinyl can be installed on any flat surface, indoors or outdoors. We have glossy, matte, and UV protective laminates available to cater to your needs. The vinyl can be mounted with different types of adhesives so that it can be applied to jiprock, plexi-glass, glass, plastic, and even wood. Large format vinyl must be installed by a certified, licensed, insured and bonded professional. The surface should be cleaned, and any old advertisements should be removed. We will re-prep the surface before applying the window film. We guarantee our work is bubble and wrinkle free!